This ham and broccoli quiche makes a fantastic lunch or brunch dish, and it's super easy to put together. Use a ready-made pie shell or use your favorite pie pastry recipe. Ingredients include sliced mushrooms and tomatoes. Feel free to omit the mushrooms if you aren't a fan. The tomatoes add color. Use smaller grape tomatoes or cherry tomatoes if you like. This is a great way to use leftover ham, but cooked bacon or cooked crumbled sausage may be used instead. Melt the butter in a skillet or saucepan over medium heat. Add the sliced mushrooms and cook until the mushrooms are tender and have released their liquid. Drain them and set aside. Line the pie crust with foil and fill with weights or dry beans. Bake pie crust for about 10 minutes or until it looks dry and lightly browned. Remove the foil and weights and let the crust cool. In a bowl, combine the milk, eggs, butter, flour, salt, pepper and 3/4 cup of the cheddar cheese; whisk until well blended. Set aside. Sprinkle the remaining 1/4 cup of cheddar cheese over the crust. Layer the drained broccoli, ham, and mushrooms on the cheese layer. Pour the milk and egg mixture over all, taking care not to overfill. Depending on the size of your pie dish, you might have to discard a little of the egg mixture. Or bake the extra mixture in a buttered ramekin. 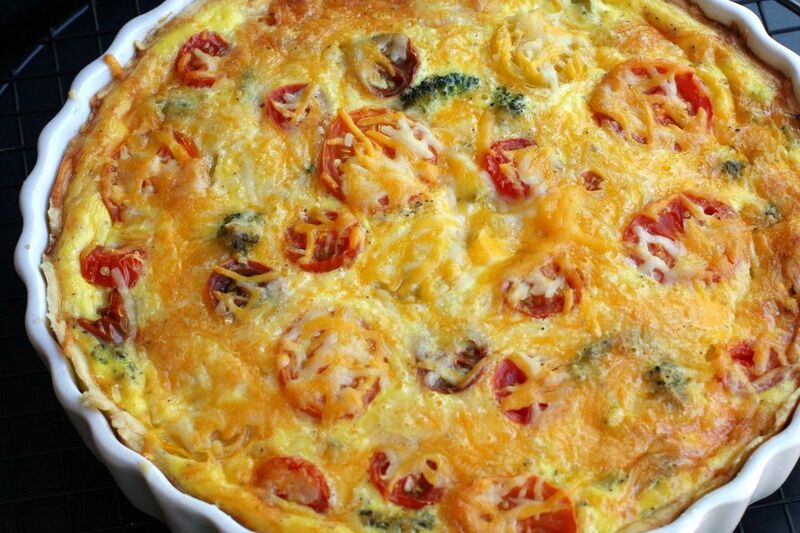 Arrange the tomato slices over the top of the quiche filling. Place the quiche a foil-lined baking sheet or large square of foil under the pie dish to catch any drips. Bake for 35 to 45 minutes or until a knife inserted into the center comes out clean.